There are some fabulous Halloween projects out in blogland again this year and I am just loving seeing creations by Shelley Hickox and Richele Christenson. If you haven’t seen Richele’s configurations box, you really should go take a look at the stages she has taken us through to make it, fabulous work. Beware a photo heavy post!!!! So this is my DT sample this month for Country View Challenges where the lovely Danielle has chosen ‘Something Spooky’ as the theme. This is my interpretation of it. It started with a large 10 x 12 inch canvas. But I turned it over as I wanted more of a shadow box design. I painted the edges black and added tissue tape to give me the framed effect I wanted. I then made the background using distress paints, spritzed, smooshed and card dipped into it, drying and dipping until I was happy with it. I then used the paints and distress inks with Tim Holtz masks to give more layers and dimension. If you can see the eye chart I used the bumping method too (learnt at a Lin Brown workshop). I then stamped some stamps from The Chemist set. Next I set about making a corked dome and as with all the other bottles you will see I smeared matte medium on them, let them dry and then covered with rock candy crackle paint. This one has a distressed charlotte doll inside. Here are the bottles and labels, all a mixture of ideaology and 7 Gypsies. This bottle had a remnant rub label (bone dust) and has some small plastic bones and some glitter inside it. Wow the crackle really shows on this which has some glitter and re-inker inside it. Here is The Chemist himself, framed with the new sizzix TH ornate frame die. This was daubed with distress paints and alcohol inks to get the rusted, aged effects. A collection of more spook elements. The bats and cobwebs are TH dies and both given a coat of rock candy crackle paint. The little birds came from a Halloween confetti bad I bought last year (in fact I didn't use them in the end) and the spider and fly are plastic. The candle stick was rusted and the skull was given a coat of distress paint and rusting powder added in places. The pumpkin is made of foam and has been cut in half. These are the vintage ephemera, stamped and distressed using TH stamps and you can see the paper clip was rusted too. These are two pieces of wood I cut down, inked and added rock candy distress paint to these too. So onto the finished frame. and also added this at the end as it needed something here for balance. I think it has worked well. So there we are, hope you enjoyed all the photos (all 26 of them lol), there is so much going on in this piece I just wanted to capture it all. October already and soon we will be well into our Christmas makes. Thanks for your good wishes for Cimmie. The vet was very pleased with his paw and took the stitches out which meant he could have that horrible collar off. He's allowed out to play again and was out all day yesterday till late evening, so I think he's happy to be getting back into a normal routine. His brother didn't miss him though, all he did was hiss at him when they came in for supper last night. Brotherly love!!!! Looks like you had a lot of fun, great pictures too! I didn't count the photos, but the gorgeous little elements , hundreds!!! And everything is so well placed....it's beautifuuuuul...no , ok, I meant, it's spoooooky!! Wow this is amazing Brenda! Wow what an absolutely fabulous piece, so much work and so much detail. It's stunning!!! I don't like this one bit, nope not at all! I LOVE IT! My scary goodness, you have cover this with so many awesome details. I agree with turning it over adding extra interest and the shadow box affect is superlicious! So awesome! Hugs! what an amazing piece.. I don't find the right words for this! Brenda this is superb!! I keep looking at it and see something different every time, love every inch of detail you have put into this. This is a piece of wonderful Art, I was drooling over the Bg before you added all the multifarious and amazing elements. Absolutely gorgeous piece. Lots of brilliant details and I love the colours too. Awesome altered canvas, have so enjoyed looking at all the detailed photos. Fabulous!! Thanks for sharing your amazing process! wow this is absolutely fabulous! So detailed! Wow! Came out gorgeous. I love how you turned the canvas around to turn it into a shadow box. I will have to give that a try! Outstandingly brilliant, Brenda... I'm absolutely blown away! So many amazing details, and all that fabulous crackle texture. A wonderful layered background to start from too, and the texty frame of course delights me, as does all the rust. An almighty WOW from me!! Another Brenda masterpiece having trouble choosing what is my fave part. Chucks it all is. This is the sppokiest! Love all the fun details, especially the eclectic mix of bottles. I had no idea that little Charlotte would fit in there.... how cool! Stupendous! Love every bit you used in this! OMG, OMG, OMG ... okay I seriously hyperventilated... I got so excited!! This is over the top amazing ( I love details) you've got so many awesome details... so fun. The techniques are so cool!!! Brenda - I havent been online in ages! But I saw your name on Blogworthy Links at TH and I was so thrilled for you, so I had to come by and say a massive congratulations. You so deserve this! Brenda - I have been trying to post this comment and it keeps eating it up. I saw you mentioned on TH Blogworthy Links and I was so thrilled for you. You so deserve this. I havent been actively online in blogosphere for ages but I had to come by and say a massive congratulations. You being mentioned pulled me out of exile! This is out of the box amazing! I cannot believe the amount of detail in this piece. Also, I see that it's made Tim's blogworthy links this month so well done for that too! Love it - a Halloween work of art! I love your project. You've inspired me to roll up my sleeves! This is fabulous - what a great use for the "back" of a canvas! And the detail photos really show off all the little details that really makes this piece pop! WOW! Looove all the little bottles filled with different stuff and labeled, even. Just wonderful! Came over from Tim's blog. Wow! What an artist you are! Fabulous! We don't do Haloween in South Africa, butI really love this piece! Tim sent me to look at your project and he was right, it is absolutely fantastic!! Great idea about turning over the canvas to make it into a different project. Bravo, Brenda - couldn't agree more with Tim about this being completely Blogworthy!! Yay! Awesome work Brenda, arrived from T1m's Blog. Love the photography so that we can see all the wondeful minute details! Awesome project! I am making a haunted house aka. richelle and I was looking for some options to use the distress crackled vials - thanks for the inspiration! You left me speechless. I got lost in all the detail, I could not decide which was my favorite, in complete awe over it all. I love, love your creation! Wow Brenda, so much inspiration and to be honest you can never have too many photos! Amazing work. I think this is just fantastic right down to the rusty door bell. So much detail which I guess could have been quite fiddly due to size. Well done and thanks for sharing 'cos I really enjoyed every tiny bit. Oh my goodness Brenda, your project is absolutely awesome - soooo much amazing detail and in miniature too. I have been studying it for ages and love love love it all. Thank you so much for sharing this darling creation with us and for all the information you have included in text and photo form with this amazing post. Warmest best wishes from across the miles here in France. Wow, wow, and wow again! This is totally amazing - what a cool piece of work. 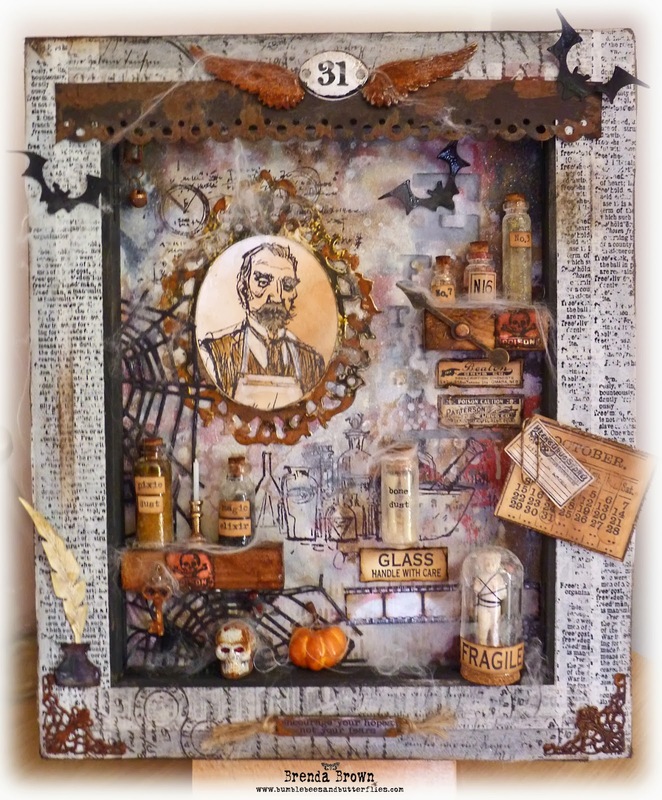 Congratulations on being one of Tim Holtz's blogworthy links! Clicked a link from Tim Holtz' blog ... love this! :) Fabulous thought into every piece. Huge congratulations on your Blogworthy link - well deserved! Just one word, but a million words would NOT describe this lil' masterpiece FAN~FREAKIN'~FABULOUS!!!! Love it! Feel like I'm right there in this guys lab! Cool piece! I don't know what to say! It' stunning!!!!!!!!!! This is beyond fabulous! Love the turn around...great idea! Just discovered this post. LOVE all the pictures and your tiny attention to detail! Gives me ideas for an upcoming project! Thanks so much for sharing it with us.